Which One Of These Iconic Video Games Was Originally Planned As A Mac Exclusive? Which Song Was Requested By Carl Sagan But Not Included On The Voyager Records? At this point, the game name “Halo” immediately calls to mind the Xbox platform where the video game and its successors have been must-have games since the launch of the initial title in the fall of 2001. Back then, to find an Xbox owner without a copy of Halo was like finding a Nintendo fan without a Mario-themed game of some sort. Yet, originally, Halo was destined to become a Mac exclusive. 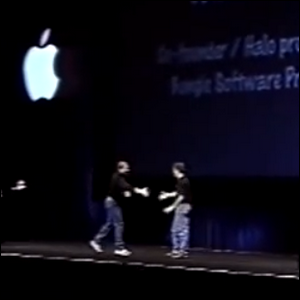 In fact, it was such a big deal that Steve Jobs personally introduced the lead developer of Halo, Jason Jones at the 1999 Macworld Expo—seen in the screenshot here. So how did Halo start life as a Mac-exclusive and somehow, two years later, become one of the most successful Xbox titles? Bungie, the development house behind the game, made a name for themselves with solid Mac titles throughout the 1990s—like the popular Marathon franchise games, a set of three first person shooter games that were among the most popular Mac games around. When Apple wanted to push the idea of the Mac as a gaming platform, it was no surprise they picked Bungie to showcase a great game at Macworld. What happened between the crowd-wowing game reveal in 1999 and 2001 though, infuriated Steve Jobs. Less than a year after the announcement, Microsoft bought the entire studio, had them retool Halo for the upcoming Xbox platform, and for the next seven years Bungie would remain a Microsoft company (and even when the company split away in 2007, Microsoft retained the rights to the Halo franchise).